Breaking the Full HD screen barrier on our handsets has been the subject of myths and speculations ever since we broke the HD one, and now, with the HTC Droid DNA, we have for the first time something tangible we can buy and carry a 5" 1920x1080 pixels screen with us at all times. Just to put this in perspective, the record-breaking MacBook Pro with 13" Retina Display is at 227ppi. 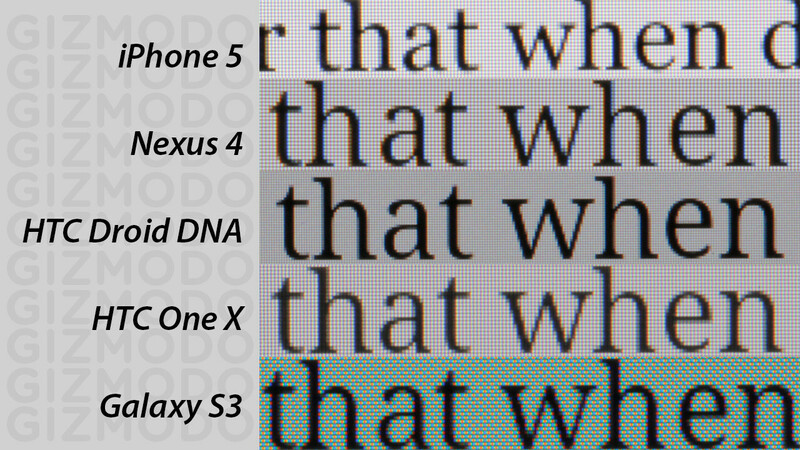 At the Droid DNA's print quality 440ppi pixel density, the main advantage is that the image is closer to the perfect human eyesight, which maxes out at around 477ppi, than anything out there. 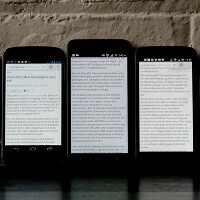 Is this a revolution in mobile screen technology or an incremental improvement? We'll give you the facts and let you decide for yourself. First off, the perfect eyesight graces almost nobody, and it is Apple's Retina Display term threshold of 300ppi at 12" (30cm) distance that holds true for the vast majority of people. Those with great 20/15 or even 20/10 vision might still be able to distinguish individual pixels from a foot distance at 300ppi, whereas at the Droid DNA's 440ppi this is nearly impossible for anyone, unless the screen is brought very close to the face of a person with a perfect eyesight. Still, this pixel density reduces border jaggies in text and small detail much more compared to even the current high-end HD screens, as you can see in the microscopic comparison on the right. While it makes reading, for example, a bit less tiring for your brain in theory, as it has to spend less effort to recognize the letter, the difference of efforts in reality is very minuscule and unlikely to be noticed in comparison with a nice high-def mobile screen, even if you read for hours on end. Another advantage is that you can watch Full HD videos with 1080 definition in their complete glory on this display, so you will be able to see all the details of the footage taken with the phone's camera, for example. The difference in perception, compared to an HD 720 video on a screen of this size at a normal viewing distance, however, is unlikely to tip the scales in the 1080 definition favor just for this feature alone. You also gain more details to zoom in and work with if you are editing a photo on your screen, which again is an unlikely pastime on a phone display, at least not in depths and duration. What about the other important display characteristics besides pixel density? Given HTC's traditional ties with Sony for its mobile display panels, in the Droid DNA we might very well have not LG's 1080 panel, but rather something like the 5" Full HD panel on the right that Japan Display Inc said will go into mass production in October, just in time to be fit into the DNA's inventories for Verizon. The company is a joint-venture of Sony, Hitachi and Toshiba, created with the help of the Japanese government precisely to take advantage of the mobile revolution. A further proof to that theory is that HTC is calling the display type Super LCD 3, and S-LCD is a Sony's term for the tech that allows us high quality IPS-LCD displays, like the one we find in iPhones and Android or WP8 flagships. Such Full HD 5-incher, but with the company's WhiteMagic technology, is expected to make a cameo in Sony flagships next year, too. As you can see, besides the incredible pixel density, which brings about 2.3 times more information situated on the screen at any given time compared to the current 1280x720 high-ends, the rest of the specs match them closely. We have 500 nits of brightness, which seems to be the threshold for decent sunlight visibility. The S-LCD 3 technology allows for brighter light transmission at lower power consumption, which somewhat explains the pedestrian 2,020 mAh battery in the Droid DNA, since the power draw in the end is not higher than the one of current HD displays. That brighter backlight, however, doesn't translate in more than 500 nits partly since at such pixel density the dots are packed much tighter in comparison with a 720p mobile screen. Indeed, in the smartphone row below, we notice that the Droid DNA screen is not brighter than the iPhone 5 or the One X, for example, which are examples for two of the great mobile LCD screens currently out there, and seems to be about on par with the Nexus 4 at maximum brightness. Moreover, the iPhone 5 covers the standard NTSC color gamut almost perfectly, and can be the benchmark for color temperature and calibration against other handsets. In comparison to its true white, the Droid DNA colors look somewhat off, which is backed up by the 71% NTSC ratio in the spec sheet above, meaning it is able to display about 30% less than the standard color gamut, which is nonetheless comparable with other good mobile LCDs out there. The Galaxy S III's AMOLED panel, for instance, goes way above the NTSC color gamut with its punchy colors. Screen calibration specialists say displaying less than the standard is actually preferable to going above, if you are a screen purist, though a lot of people enjoy the vivid AMOLED colors. As for the contrast ratio, it seems to be on par with the other good LCD screens out there, and the viewing angles are high up there too. In a nutshell, what we get with the HTC Droid DNA is a 5" Full HD LCD screen which sports resolution worthy of a perfect eyesight, while the rest of its specs like brightness, color representation, contrast and viewing angles are comparable to some of the best mobile screens currently on the market. In that case, what do you think, is the 442ppi pixel density a "must have" for you, all other things being equal, or a "nice to have" ? than y u use Nexus7 Pic as your DP...??? What, so now you can't have an iPhone and a Nexus 7? in her "phones you own" section it displays a One X....... :( That being said DNA and Nexus 4 FTW!!! Wendy, when did you become such an iFan? shes been trolling everyone since forever. Why do you prefer something that is not the best??? ever tried pinch zooming with one hand? or any multi touch for that matter? Darn Wenda, do you do that when you're outside? I'm worried about the position of your middle finger when you do that... P.S. If you still choose to do that, don't ever lift your phone up to your eye level. The Note 3? The Note 2 just came out. Got to admire that spirit of yours... But it still makes you sound dumb...'cause you're way ahead of Samsung! Especially when Samsung haven't even announced it yet. 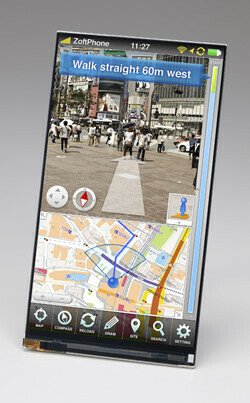 Not saying Note 3 won't exist, but Note 2 is still a big thing in the mobile universe!! well i dont feel like upgrading to note 2 my sgn1 and sg3 r just too good for me right now.... But surly both my phones will be aged when sammy release note 3.
might as well wait for the Note 4 then. This phone is awesome. I've been waiting for HTC to drop a 5" phone on the market. The screen is amazing. It sets a new standard for pixel density in today's market. I want this phone as soon as it drops. droid dna is just the best monster out there. better than any in its catagory. look at the build quality, htc is always a step ahead in terms of quality. but lacks marketing. any ways i hope dna will just rock, good luck htc. love ur phones. What troubles me is the lack of battery behind the display. My Evo has a 2000mAh battery and while I can't complain about its battery life, it could be better. The DNA has virtually the same battery pushing twice as many pixels and a quad-core processor. And yeah, HTC could really use a marketing campaign like Samsung has been forcing down our throats for the last few months. If Verizon is making this their flagship, no doubt it will get plenty of ad time. That is why VZW is selling accessory battery packs when you pre-order the DNA.... They already know you will be needing more than one battery to get through the day with the DNA. oh and yes for nokia lovers.... 920 lumia is a good phone too but its totally different from this version of android. i would say if HTC really works on marketing this time, then no is gna beat htc. in terms of quality, sense software and music its just steap ahead of all phones or so called phablets. thanx all. and again HTC... WE LOVE UR PHONES. S4 will definitely have this. Waiting for it. 6 months tops. 6 months is a LONG time in this business. For Samsung's sake, I hope they have something a bit better by then. Exynos 5 could be inside it. here's hoping. Where is Nokia Lumia 920 in this comparison?? ?